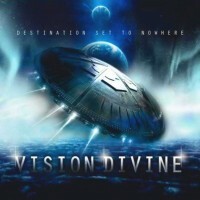 RockUnitedReviews: VISION DIVINE: "Destination Set To Nowhere"
I can recall when the astronauts shared a dream, they ceratinly had the strength and focus to set off on their space travel(s). 9 Degrees West Of The Moon (the title of Vision Divine's 2009 album release) neither far nor deep enough to journey in their search for new ideologies and eternal peace? It could be the Italians are sick of hyperspace and therefore the rather cunning title of their latest space metal effort, "Destination Set To Nowhere". Reading the lyric to the title track and I quote, "Destination set to nowhere out there I'm gonna fly. Let the vessel sail a new way it's time to say goodbye", end quote, and it's obvious that at least some of the astronauts are fed up with space and are about to jump ship? But no, quite the opposite since this is their best effort so far. Plenty of magical sweeping keys to be found on the record. V-e-r-y melodic "neo-classical" power/prog-ish metal, wailing solos, massive choirs, double-bass drumming, and pretty much anything else that goes along with lederhosen and Swedish meatballs. The smashing guitar vs keyboards interludes throughout the album, straight off the back catalogue by Yngwie Malmsteen and Jens Johansson? Dream Theater? Yeah, definitely, but they were inspired by the Swedes. I find it difficult to name any favorite tracks since there are no real downers. Sure, a couple of not so great moments and the singing accent of Fabio Lione and especially the pronunciation of "The Lighthouse" (track six) gets on my nerves. Stop bullying the man? Fair enough, nitpicking, the vocal performances on this record, Lione's best work up to date. The music of Vision Divine: ten-times better than Rhapsody Of Fire. Try this if you're not normally into the widdly-widdly and merely enjoy the odd album such as "Images and Words", "Mercy Falls" or "Visions". Obviously not quite as great but a pleasing/pleasant substitute.